I rarely post sketches of things - not really because I'm worried about people "stealing" ideas (isn't that what fashion does anyway?) but really because I sketch so much but only about 1/3 to perhaps only 1/4 of it is actually worth it. The flats board here was for a boutique collection in California that was supposed to happen some 6 months or more ago that never ended up going anywhere (yet?). I stumbled upon these again recently and was pretty excited about the color choices, contrast fabrics, etc. I had forgotten almost all about it. I figure by now, it's safe to release these. Otherwise, they're just lost to time. This came into my head in April... then last night only got the swirly things added onto it. I kind of think I need to make it. Somehow, I had an eveningwear moment happen. I rarely if ever design eveningwear but when I do, it has a definite vintage vibe. The one on the left almost seems 20s-30s and the right one is more 50s. Early concepting for the "Mix n Match" dress. 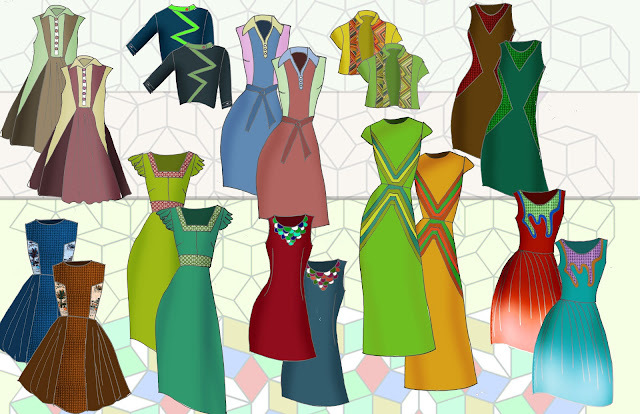 The idea is that all these pattern pieces will mix and match unto the same dress foundation to get a sort of build-your-own-dress. I suppose it's not unlike Built By Wendy's fabulous dress book (she has a jacket one too) but the idea helps me produce more than one dress with no changes to the sewing patterns, just adding or subtracting pieces to cut. I still actually really want this jacket. Some old stuff from 2010. Perhaps super early ideas of the cloud dress happening here? I have a scarf with an ambiguous pattern - is it waves or clouds? And that inspired the pattern on this dress. I'll perhaps have more sketches to post in the future, but that's all for now! Just a peek.